Borges warned, “a book that does not contain its counter-book is considered incomplete.” The same could be argued for painting, whose commonly accepted Western hierarchy reinforces a dubious linear narrative. Kamrooz Aram’s playful exhibition centers on dismantling this hierarchy in favor of an investigation of materials and forms. It is unclear whether the ceramic, brass, and terrazzo sculptures included in installations such as Blue Backdrop for Minor Arts and Green Movement, both 2018, are sacred artifacts or decoys. Blue Backdrop lifts a vase on a high pedestal, literally elevating the decorative alongside the sculptural. The piece sits in front of an oil-and-pencil on linen geometric painting whose outlines have been left purposefully exposed. Through these vulnerable markings, it’s impossible not to question the significance between object and painting. Which one is meant to activate the other? Aram omits wall texts and spotlights, and shifts away from authoritative authorship, to focus on how the objects interact with each other in the space. The paintings risk appearing as mere mimicry of geometric designs. But to fully contemplate what the artist is asking, the viewer must embrace a spiritual lens. Aram uses objects that range from acquired valuable, authentic antiquities to replicas he’s purchased from museum gift shops. They invoke holiness. Yet, we are left to wonder, is there room in the museum for the spiritual? And can it come from homage? In his paintings Ornamental Composition for Social Spaces 17 and Ornamental Composition for Social Spaces 20, both 2017, Aram again leaves the grid lines exposed, so that they become painterly gestures themselves, a riff on the rigidity of modernist style. 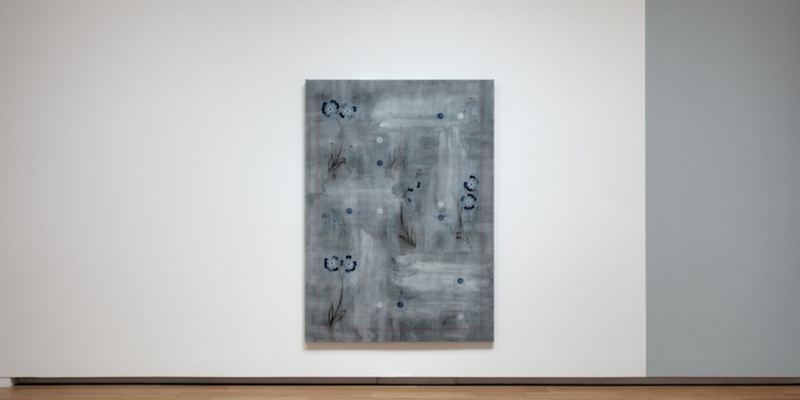 The grids, errors, and geometric forms found in Aram’s paintings are a throwback to modernist language, but the artist subverts these tropes by including floral patterns. This imbues his work with a sense of timelessness and puts the idea of what makes something modern into question.